Second longest power trail in Northern Europe. 300 caches. Historically, Vestfold is known for a large number of burial mounds from the Bronze Age, important Viking ship finds and for Norway's first urban community, Kaupang in Tjolling east of Larvik, and one of the oldest existing cities, Tonsberg. In recent history, particularly shipping and whaling in the Southern Ocean has been important. In the 800s the Norwegian national area was devided into 30 small kingdoms. Vestfold was, along with Lier and Eiker in Buskerud, a separate kingdom, and local officials had established a dynasty that later could unite Norway into one kingdom. The family of Harald Fairhair, the first king, was from Vestfold. By taking you through this power trail (V.V. PT #001 - #300) and Team Fredrunes power trail (TEAM FREDRUNE'S PT #1 - #200) , you will discover "hidden" roads and beautiful scenery in the inner parts of the county that very few people get the opportunity to do. The reason is that they don't know anything about this road network and that they has no "natural reason" to visit this area. We wish you a safe journey in this beautiful county we are so proud of. Certain places along the route are narrow. Please be careful and have the turn signal on when you park along the narrow road / traffic locations. Be considerate and park as far to the side of the road as possible. It's farther between caches on roads with heavy traffic. There we have put caches in places where you can park completely off the road. Car, motorcycle and bicycle can be used. Remember to bring pen / pencil. Official rules allow signing with sticker and stamp, but our desire is that this is NOT being used for logging this power trail. We encourage you to sign the logs with pen / pencil. This is to save space in the logs, thereby limiting maintenance. We hope that everyone respects and understands our wish. Caches are equipped with rite-in-the-rain logs with a capacity of approx. 320 signatures. There is some larger containers along the trail, to put travel bugs and coins in, but the majority of the caches are preform PET bottles with screw cap. There are also some film canisters. You may want to bring gloves to prevent sore fingers. 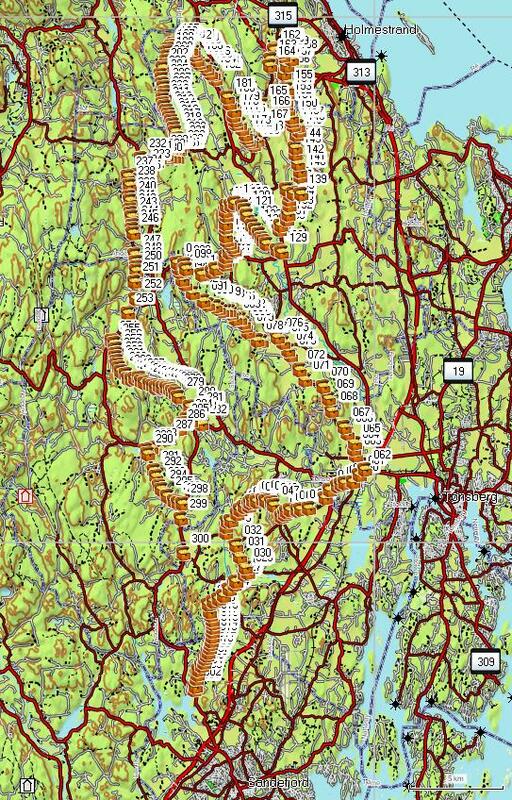 This route starts in Sandefjord town and is approx. 100 km long and will take about 15-20 hours to finish (by car). There is food store, gas station and toilets in Haukerod, Sem, Andebu and Kodal. These are marked as waypoints in the cache description below.